Mayor Teresa Jacobs convened the first Heroin Task Force work session on Aug. 17 with co-chair Sheriff Jerry L. Demings,as well as Deputy County Administrator of Public Safety and Health Services George Ralls, M.D., Phil Scarpelli, Interim Regional Director, Department of Children & Families, Substance Abuse and Mental Health, and numerous local law enforcement, addiction and treatment experts to address the extraordinary spike in local heroin use and overdoses from the highly addictive drug. 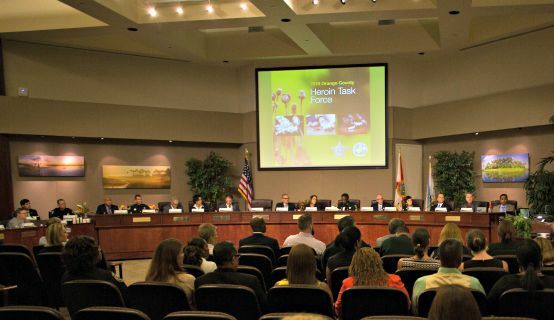 Created by Mayor Jacobs and co-chaired by Sheriff Demings, the Task Force is comprised of key community leaders who will provide their expertise in the areas of law enforcement, education and prevention, healthcare and treatment to address the increase in heroin use and overdose-related deaths in Orange County. Although prescription drug abuse is still a serious problem, heroin has become easier to obtain and has a very high-purity level. In 2014, there were 90 deaths in Orange County associated with heroin, a staggering 84 percent increase from 2013. In 2014, local law enforcement reported 606 heroin submissions to the Florida Department of Law Enforcement lab, a 400 percent increase since 2010. According to the 2013 Florida Medical Examiner’s Annual Report, deaths caused by heroin increased 78.7 percent in the state when compared to 2012. A recent study released by the Centers for Disease Control (CDC) also shows the number of heroin users in the U.S. has grown by more than 300,000 in the last decade. As a result of Florida’s comprehensive prescription drug legislation, the implementation of the Prescription Drug Monitoring Program, local regulations, proactive law enforcement and an increase in treatment admissions, over the last several years, Orange County has seen a decrease in the number of illegal pill mill operations and prescription drug-related deaths. With fewer pills on the street, communities are now experiencing an increase in heroin use, which is a cheaper alternative for those addicted to opiates. “Heroin has become a popular alternative. It is essentially the same chemical as that in prescription painkillers, but it costs roughly five times less on the street,” CDC Director Thomas Frieden has said. Another study by the CDC issued earlier this year, showed a steady increase in the number of drug-poisoning deaths involving heroin. Drug poisonings are the number one cause of injury-related deaths, with 43,982 deaths reported nationwide in 2013. Photos from the Heroin Task Force work session are available on Flickr for use by the media.